This coloured lithograph is taken from plate 13 of Sir Charles D'Oyly's 'Views of Calcutta and its environs'. D'Oyly was the most famous contemporary amateur artist in India. 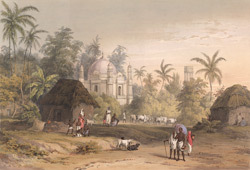 He spent most of his career in Calcutta, and was more likely to depict native parts of the city than any of his predecessors. Sibpur was one of the little local villages absorbed by the rapid spread of Calcutta. D'Oyly here depicts its mosque. The area became well known when Colonel Robert Kyd established the great Botanical Gardens in 1786.